We’ve been eating our root vegetables for a few weeks now, but I do like to grow a few brassicas to vary the meals.I’m not a great lover of cabbages, apart from Red cabbage which is just my most favourite winter vegetable, but I do like to grow a few cauliflower and calabrese. Not because the family are especially fond of them, but more because they can present a bit of a challenge for the amateur gardener. I start my seeds off in mid April in seed trays, pricking them out into 4″ pots when they are large enough to handle. Inhibiting any growth at this stage can produce problems later, so I give the plants a good start, using a half decent potting compost, with a little extra fertiliser.I tend to use pots because the roots of brassica develop quite fast and pretty soon, need plenty of room to grow.With a little extra care and attention at the planting out stage will repay you handsomely, with those gorgeous little white curds from July onwards. 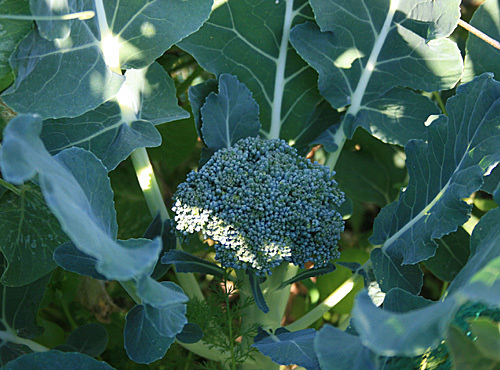 Cauli’s don’t need as much space as some of the brassicas, so I plant them out about a foot apart in rows 18″ apart. If you are on clay, or sandy soil you will need to add some lime to the planting holes. If you’re on chalk, as we are in Hampshire, there is no need to add any more lime to the soil. Keep them well watered on a regular basis and they should be fine, but try to resist watering little and often or you could increase the chances of splitting the stalks. Best to give them a really good watering once a week, ideally directly at the roots. 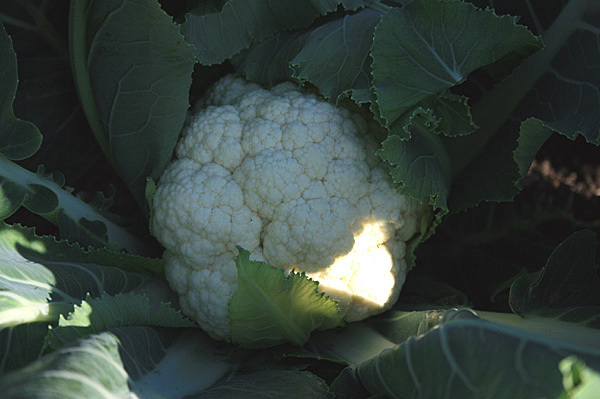 If you want to keep the heads of your cauliflowers nice and white, you’re going to need to protect them from the sun. Easiest thing to do is fold over the leaves when the heads are about 4″ across. I don’t give my Calabrese any special treatment, other than to prepare the soil with a bucket full of compost and a sprinkling of fish blood and bone. I also tread the ground nice and firm before planting. Not sure why but my dad always planted his greens into firm ground, and it seems to produce results. In around 2 weeks I’ll lift all my Cauli’s, blanch them in boiling water for a minute, allow them to cool, and then pop them into the freezer. We’ll eat the Calabrese as they mature as I find they don’t freeze terribly well. Special treat for tomorrow’s lunch, Cauliflower Cheese, made with the most wonderful local cheddar, with just a hint of nutmeg.